Enjoy instant rewards when you purchase selected Samsung devices and welcome four brand-new Galaxy devices, the Galaxy A6+, A6, J6, and J4 this Raya! During the festive season of Hari Raya Aidilfitri, don’t we all wish to balik kampung with a brand new car or furnish our beloved homes with the latest in smart home appliances and other great rewards? Samsung Malaysia Electronics is now giving you a chance to make that wish come true this coming festive season! From 24th May to 24th June 2018, those who purchase any Samsung Galaxy device will stand a chance to bring home fantastic prizes that include luxurious sets of wheels from Mercedes Benz, Honda, Vespa scooter, Samsung smart home appliances and gift cards – all worth up to a total of RM2 million in value! “Samsung’s mobile devices are designed to enrich our customers’ experience in an innovative, creative and productive way. This is evident in our line of devices; from smartphones, tablets and wearables, there surely is a product that is suitable for you. With such a grand line-up of prizes and rewards for our customers, this is the best moment to finally get your hands on the Samsung mobile device that you have been eyeing for a while now! Who knows, you may be the lucky one to drive home a brand new Mercedes Benz!” said Yoonsoo Kim, President of Samsung Malaysia Electronics. To be in the running to win these fantastic prizes, purchase any Samsung Galaxy device from 24th May to 24th June 2018, and answer a simple question on the entry card given. Lucky winners will be selected randomly through a draw, and announced in July 2018. Customers who purchase either a Galaxy S9 or Galaxy S9+ will be rewarded with a Samsung Protection Plus plan worth RM298. Those who purchase a Galaxy Note 8, Galaxy S8+, Galaxy S8, Galaxy A8+, Galaxy A8, Galaxy A6+, Galaxy A6 or a Galaxy J6 will be entitled to a complimentary Screen Protection Plan worth up to RM149. A limited edition Petronas Gift Card worth RM20 will also be given to those who purchase the latest Samsung Galaxy models – the Galaxy A6+, Galaxy A6, Galaxy J6 and Galaxy J4. In conjunction with the festive season, Samsung also recently introduced four new models to its Galaxy series family – the Galaxy A6+, Galaxy A6, Galaxy J6 and Galaxy J4. Sporting Samsung’s iconic Infinity Display, the new Galaxy A6+, Galaxy A6, and Galaxy J6 provides uninterrupted, immersive experiences on a Super AMOLED screen; whereas the new Galaxy J4 comes equipped with a 5.5” HD Super AMOLED display for high contrast and vivid viewing experience. The four new models are now available at all Samsung Experience Store and authorised dealers from a recommended retail price of RM599 onwards. 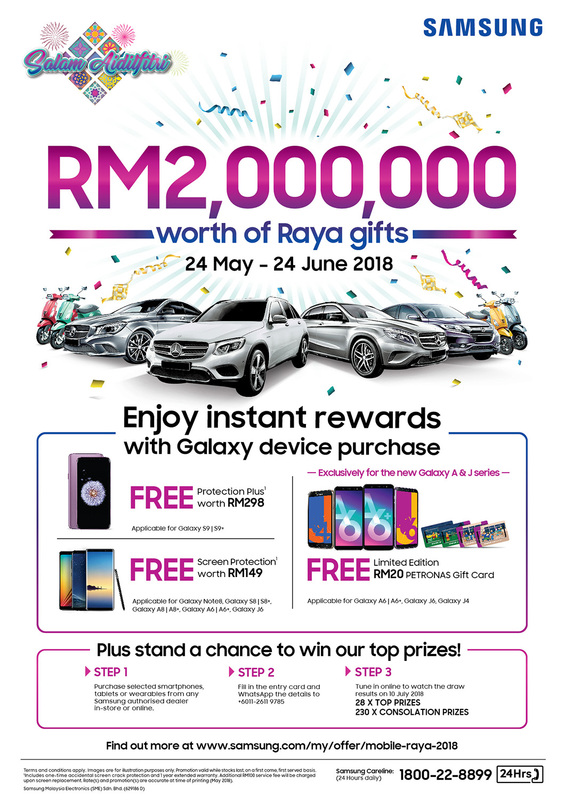 So, go on and purchase a new Samsung Galaxy device or two, and you might just bring home an epic Raya gift, courtesy of Samsung Malaysia Electronics! For more information about Samsung’s Raya 2018 Campaign Promotion, visit http://www.samsung.com/my/offer/mobile-raya-2018/.